The great thing about it is that it always kept me guessing. So obviously, I had a very stong feelingthat Patch is one of the bad guys, but then you find out he's not. And well, the whole thing gets pretty shocking. Very unpredicable. There are some parts of the book that I totally didn't expect at all... I was SHOCKED! You wouldn't possibly think it would happen. I'm just sitting there staring at the page with my mouth hanging open! Fitzpatrick sure knows how to write to engage. In Crescendo, all the moments with Nora and Patch are very much exciting. You can feel the electricity between them and you'd just want them to be together. It seemed like the ending was going to end simple with Patch and Nora but then there's a cliffhanger... and I don't really like them. And boy is it a humdinger. Now I need to now what happens. I just have to wait a loooooong time for the next book, Silence! This has been on my TBR pile for a while. I like Hush, Hush but didn't love it so I think that is my hesitance to pick up this book. I'm glad you liked it and your enthusiasm makes me want to move it up my TBR list. I LOVED Hush Hush... I can't wait to start Crescendo! I completely agree with you! That cliffhanger brought completely despair to me! I can't wait for SILENCE! Love patch (or should I say Jev!) and nora! Ah I love Patch. In Hush Hush he was just wow! And when I listened to the audio book at night I swear I dreamed about him. Can't wait to read Silence!!! I love Becca and this is one of my top favorite series! I can't wait for Silence! I gave the first in the series only 3 stars, so I wasn't sure whether to read this one or not. That you loved it makes me want to give it a try. Patch is cool, but somehow I couldn't warm up to Nora. I found this one disappointing. I wanted to like it more then I did, a lot of times the second book acts as a bridge so maybe the 3rd will be better. This book kept me on edge to. Keeps me thinking what will happen next. I must now have to wait until October for Silence. Oooohhh! I cannot wait to read this book! I have the first one and this one in the series! I'm so with you. The baseball cap drives me crazy! :P That ending was pretty shocking. I can't believe she left it so cliff-hanger-y. Can't wait for Silence to come out. Need to read this one! 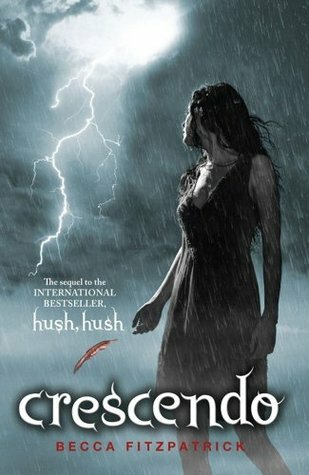 Absolutely loved Hush, Hush and I have this one on my shelf, but I haven't been able to get to this one yet...great review!